While completing the readings and viewing the videos for this module, I developed a curiosity for Indigenous knowledge and community. I wondered how media is used within indigenous communities to share and teach their knowledge within their communities and with others around the world. 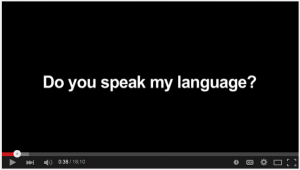 The first link is to a YouTube video titled “Do You Speak My Language?” created by youth at We’koqma’q Mi’kmaq School in Nova Scotia. The video is directed and produced by Mi’kmaq youth who interview members of all ages within the community. The focus questions revolve around learning the Mi’kmaq language, Mi’kmaw. The second resource is a link to an article titled, ‘As If Indigenous Knowledge and Communities Mattered: Transformative Education in First Nations Communities in Canada,’ written by Jessica Ball. Media is not so much as considered an important factor in this study, but the findings is of relevance to any indigenous community, is shared via the internet. The article describes a ‘generative curriculum model’ that was used in a case study completed in collaboration with the Meadow Lake Tribal Council and the University of Victoria. In the case study, community members were invited to collaboratively teach post-secondary curriculum to help build relevance and connection of European written curricula to the Cree and Dene Aboriginal communities. The third resource is a link to a media research company called Kwusen Research and Media, which specializes in conducting ‘community-based research on traditional knowledge ad land use,’ used for environmental impact assessments. 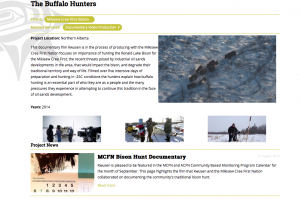 They use what they call a ‘participatory approach’ which ’emphasizes community capacity building to engage Indigenous communities in researching their own traditions and land use practices.’ They provide expertise in documenting video, websites, and web-based mapping techniques. The Community Knowledge Keeper used by Kwusen, is a customized online mapping and data management system which archives support consultation, environmental research, and traditional land use studies for Indigenous communities to share, when faced with land and resource management issues. An example of work completed by Kwusen is called The Buffalo Hunters with the Mikiswe Cree First Nation. The fourth resource is an article written by CBC News titled, ‘5 Independent Indigenous Media Sourced To Check Out Online.’ This article discusses how various Indigenous communities across Canada are using media to voice their issues and stories. Newspapers, websites, radio programs, television stations and magazines have become mainstream within the communities, and with the use of the internet, have become accessible to everyone. The fifth and final resource is an article titled, ‘Social Media in Remote First Nations Communities.’ The study took place in the Sioux Lookout region of Northwestern Ontario, and explored the link between social networking sites and community resilience. The evidence of the study suggests of those who lived in the community and were frequent users of social networking sites, created a network of interconnection of information, resources and social activity among each other within the community, as well as in the outlying communities.